Bestselling author Max Byrd delivers a brilliant, revenge-filled tale of a WWII Police Inspector, who trails his vengeful sister-in-law after her husband's death. On a relaxing vacation at Lake Tahoe, San Francisco Police Inspector Gilman and his brother-in-law, former Washington attorney Donald Kerwin, stop into a 7-Eleven--and are met with a torrent of bullets. A gunman at the register kills Kerwin and wounds Gilman, and an illegal police search follows, leading to a dismissal of charges against the suspect. Gilman's sister-in-law Nina is not only heavily distraught over her husband's death but violently outraged at the illegal search. When she learns that the killer is returning to Boston, she trails him, out for revenge, leaving Gilman racing against time to stop her. Masterfully weaving history, plot, and emotion, Target of Opportunity is an unforgettable achievement. 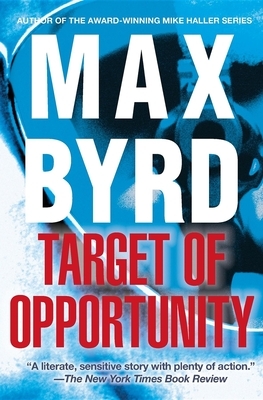 Max Byrd is the award-winning author of fourteen books, including four bestselling historical novels and California Thriller, for which he received the Shamus Award. He was educated at Harvard and King's College Cambridge, England, and has taught at Yale, Stanford, and the University of California. Byrd is a Contributing Editor of The Wilson Quarterly and writes regularly for the New York Times Book Review. He lives in California.